Pioneers in the industry, we offer single head ampoule sealing machine and single head ampoule filling sealing machines from India. We are leading manufacturer and exporter of Single Head Ampoule Sealing Machine and our product is made up of good quality. 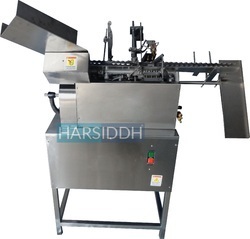 The Single Head Ampoule Sealing Machine is built on S. S. Square pipe frame and totally encompassed with S. S. Coverings, in a pleasing matt finish, Further, the large opening available at the bottom side for ease of absolute cleaning. The pendant type electrical control panel is lifted form machine for ease of operation and safety. We are manufacturing and supplying superb quality Single Head Ampoule Filling Sealing Machines. These machines possess excellent productivity and robustness traits owing to their fabrication being done by using high-end technology. Apart from this, these are supplied to customers in varied configurations as per clients' precise requirements.